Prototype model shown in image. Production model features will vary. Not yet available for sale. All future models shown may not be available in all markets. Coming in August 2019. See your local dealer for potential Pre-Orders. 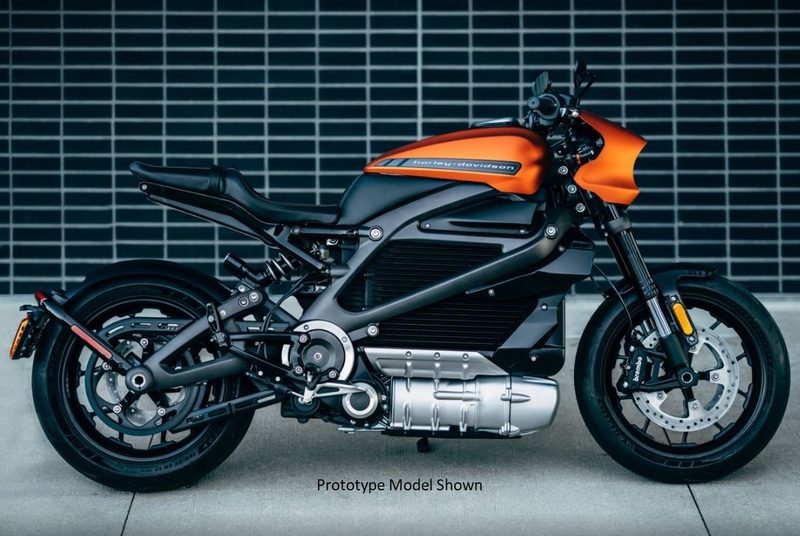 H-D REVELATION™ POWERTRAIN: The permanent magnet electric motor can produce 100 percent of its rated torque instantly – it's the reason for LiveWire's incredible acceleration. It’s located below the battery to lower the center of gravity for easier handling. LIGHTWEIGHT FRAME: The lightweight cast aluminum frame is extremely rigid, and contributes to the precise, responsive handling that makes the LiveWire™ motorcycle a thrill to ride. FULLY ADJUSTABLE SUSPENSION: The high-performance SHOWA® front and rear suspension is fully adjustable. So you can dial in comfort and handling with precision for your own riding style. H-D® /MICHELIN® SCORCHER® SPORT TIRES: The LiveWire™ motorcycle rides on premium 180mm rear and 120mm front H-D® /Michelin® Scorcher® Sport tires. They were designed exclusively to enhance the ride and handling performance of this ground-breaking machine. STATE-OF-THE-ART TOUCHSCREEN DISPLAY: A 4.3 inch, full-color, liquid-crystal, touchscreen display on the all-new LiveWire™ motorcycle keeps you constantly up-to-date on your speed, range and battery status. Customize it even more with information like music, turn-by-turn navigation, alert information and more. CUSTOMIZE YOUR LIVEWIRE™: We are designing Genuine Motor Parts & Accessories to make your LiveWire™ stand out on the road. You'll be able to customize your bike with accessories like a screen blade, hand brake levers and more.